Thank you National League players for coming thru and giving the Senior Circuit bragging right! Friday 7/9: Volunteer from noon to 5 p.m. Head to Dodger Stadium for game at 7:10 p.m.
Saturday 7/10: Photo Day at Dodger Stadium at 11:a.m. Game at 1:10 p.m. Steve Garvey Charity game at Pepperdine in Malibu at 5:30 p.m. (pictures another time). Sunday 7/11: volunteer from 8:a.m. to 1 p.m. Head to Dodger Stadium for game at 5:10 p.m.
Monday 7/12: Leave house at 8:30 a.m. to attend FanFest as a FAN before shift. Realized when I got there that I forgot my camera. Make the one hour trip (one way) home to get camera. Got back at 11:30, time to report to work to start noon to 5:p.m. shift. Check out FanFest with friends and family AFTER 5 p.m.
Tuesday 7/13. Checkout FanFest (lots to see) then lineup outside of convention to wait for Player parade. After parade, realized I lost my car keys. Checked with security, information, front desk and no sign of keys. My friend Lorena came to pick me up to head to the game after she finished watching the parade from her end at Disneyland. Brother Vic timed it well to bring me the the extra key I had left at home. Wednesday 7/14. Exhausted but back at work. In a prior post, I had mentioned that Red Sox Mickey was on the DL. He was brought back to FanFest after his trip to the mickey hospital. Note how Red Sox Mickey has his left arm all bandaged and he has a hot water bottle on top. Poor mickey. 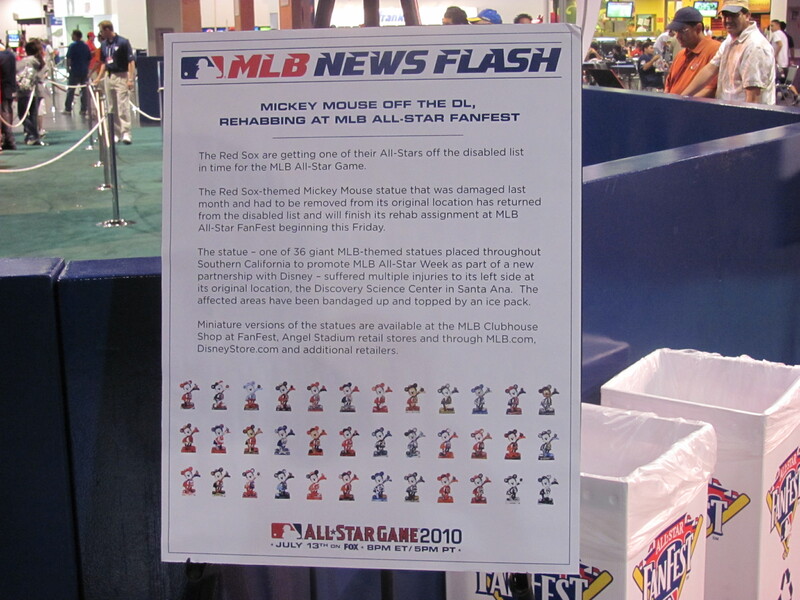 Here is the news flash from MLB informing everyone that Red Sox Mickey was starting his rehab assignment at the FanFest on Friday and possibly would be ready for the All-Star game. 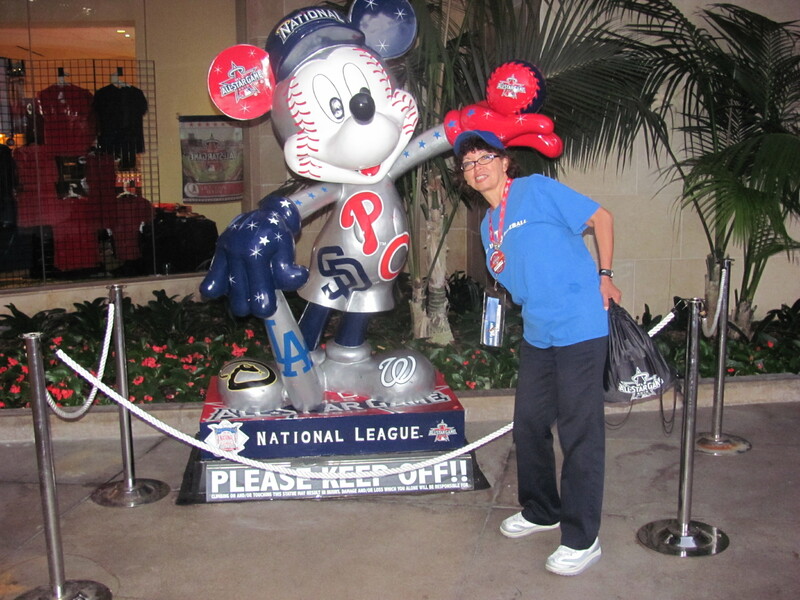 Unfortunately Kansas City Royals Mickey could not make it on time. 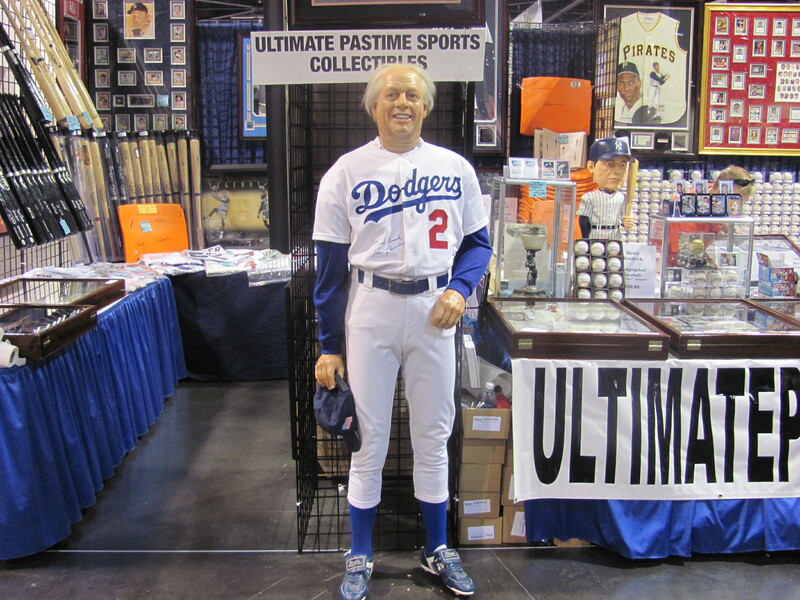 There was a wax figure of Tommy Lasorda. Have you ever seen him this skinny? 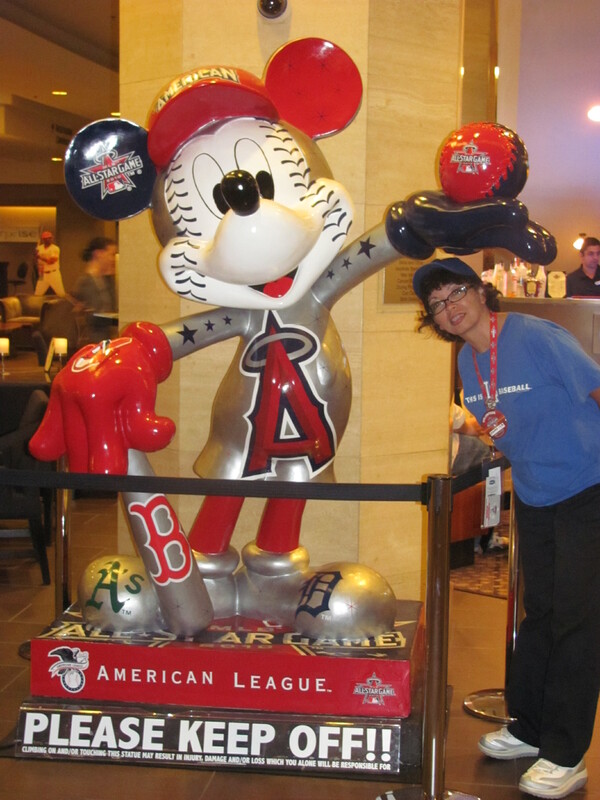 The Marriott has the The National League Mickey! After our final volunteering assignment we were given an All-Star baseball. After three days I was really tired but I would do it again. I met lots of fans, little ones and big ones and many other baseball fans that volunteered. There was a sheet to signup for the upcoming NBA All-Star FanFest in Los Angeles next year and we were told that starting in February we could sign up to volunteer for next year’s MLB All-Star FanFest in Arizona. From the Hall of Fame section:. Next post: All-Star parade and the All-Star game. Emma, that’s awesome! 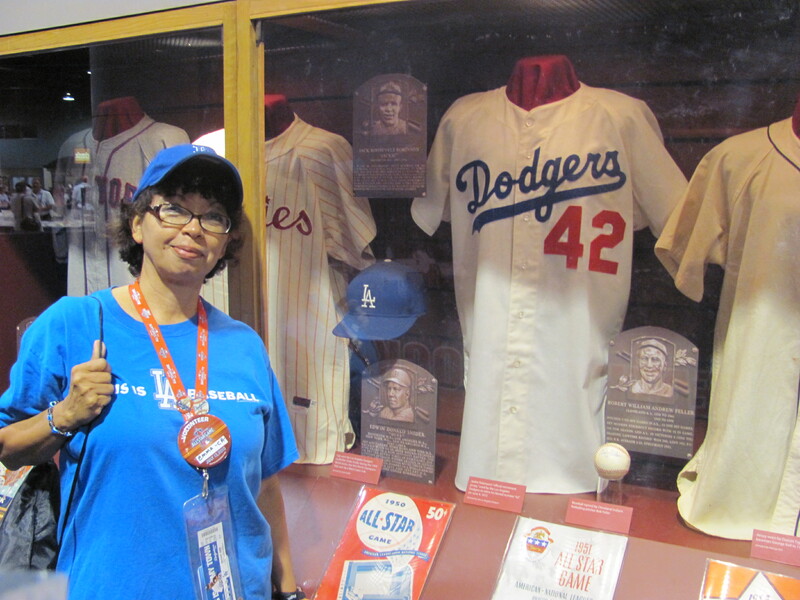 I have a pic in front of the same (at least similar) Jackie jersey from last year. Pretty cool! And no, Tommy ain’t never been THAT skinny. And what’s up with his hair on that wax figure? Good grief. I heard some kids that they were afraid of the wax Tommy. He did look like a mad scientist with that wild hair. lol. Yeah, Tommy does looks like Doc. I love the NL Mickey. They have replicas at the stores so I bought me my Dodger mickey. I am looking for the NL one too and a friend wants a PHillie one so I am keeping an eye on for that. Your team and mine took it on the chin today but we’ll get them tomorrow. Awesome pictures Emma! I’m giggling over here at the BoSox Mickey on the DL. So funny. Glad you were able to enjoy as a fan! Got to tell you…I am jealous. Hopefully someday I can do the same here in Florida to give back to MLB for all the fun and excitement it brings to my life every day. That adventure is one that will be the greatest ice-breaker event to tell to people for the rest of your life. But hopefully the Boys in Blue can get you another great event to talk about …soon. As always, love the photos and wish I was there experiencing it myself. Great photos, Emma. My wife liked the Red Sox Mickey Mouse. Go Dodgers (and Mets, White Sox, and Fish)! Glad to be back at MLBlogs. Polo of Dodgers on Demand said that they started removing the Mickeys. I only got nine and missed the Angels one even though I was ther for the All-Star game. I got the most important one though and I bought my little Dodger mickey. I hope the All-Star gets to go to your neck of the wood. Maybe when they get a new stadium ha? 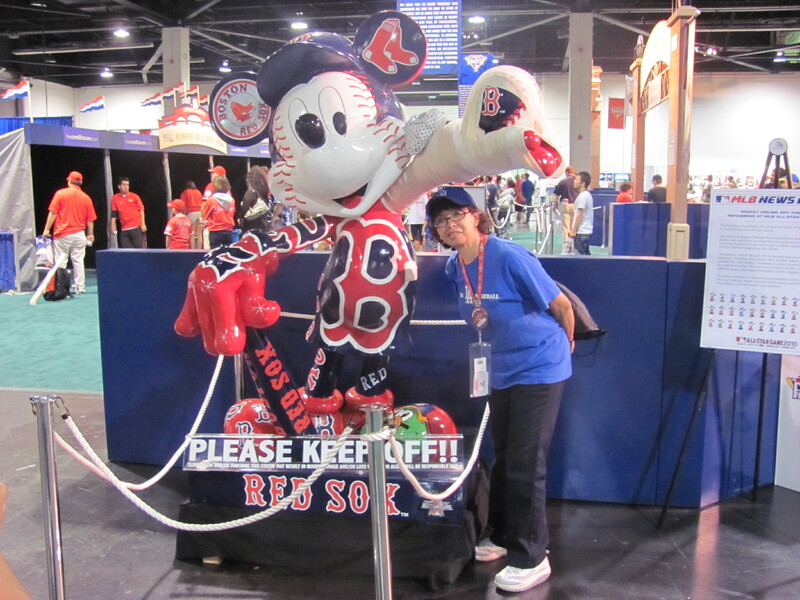 Glad BoSox mickey was rehabing at the FanFest. Los of fans enjoyed having him there. Glad to have you back at the MLBlogs Sometimes I take a whole weekend of not posting here but usually come back Sunday night. Tough, tough loss today. Padilla deserved his win. Not a good idea to bring Brox for two innings. Help! I can’t believe we lost this one today. Another excruciating loss in the ninth inning. The big thing in the game today was the Dodger pitching giving up 9 walks. Of the 5 runs the Cardinals scored 3 of them were put on base with walks. That says it all. I don’t think this team will make the playoffs this year. It’s not as good as last year’s team. I did call Dodger Talk after the game and got to talk to Ken. That made me feel a little better. Were you listening after the game? Maybe the Dodgers will do better at home against the Giants. Take care. Oh Will! I was too upset to listen to Dodger Talk. Now, I wish I would have to listen to you. I was too mad after the loss that I turned off the TV and radio. I had both of them on. I usually call Dodger Talk on Sunday after a day game because it’s not to late. So far every time I’ve called I’ve been put on the air. They use me as an example of their world wide web audience. Maybe next week I’ll have better things to talk about. OK Will, I will listen next Sunday. I hope is after a win against the Mets! Yes Emma we definitely need to pay back the Mets for that 3 game series in New York when Joe and I froze our butts off watching the Dodgers get swept. So cool that they gave you an All-Star baseball! I need to get out and see the rest of those Mickeys before they go away. Some places already removed the Mickeys like the Hilton and Mariott in Anaheim.